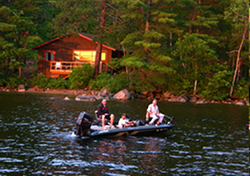 Maine's Premier Fishing Vacation Destination Owner Scott Weeks invites you to join him and his family on the gorgeous banks of Grand Lake Stream, Maine! Have your Corporate Retreat on the serene waters of Grand Lake Stream. Since 1958, Leen's has been the go-to destination for corporate retreats, summer camps, annual economic summits, and weddings. 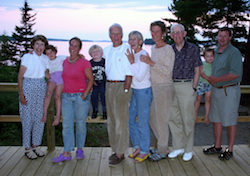 Maine Family Vacations At Leen's Lodge, we treat everyone like family. We invite you to bring yours! Family Vacations Enjoy the multitude of activities Grand Lake Stream offers with your family. "WHERE THE BEST FAMILY VACATION IS OUR "MAINE" CONCERN!" Welcome to Leen’s Lodge on the banks of West Grand Lake in Grand Lake Stream. Enjoy your Maine vacation in a rustic lakeside cabin while you are experiencing some of the most pristine and beautiful wilderness that Maine has to offer. 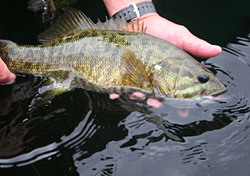 Our lodge is part of the St. Croix Watershed, which offers the best landlocked salmon and smallmouth bass fishing in the state. Enjoy an outing with a Maine Professional Guide and experience a shore lunch cooked over an open fire where you will sample your morning catch. Whether it’s a family reunion or corporate retreat, your stay will be enhanced by the upscale country cooking offered in our Dining room. End your day on our lakeside decks while witnessing an unforgettable sunset. We also offer woodcock and grouse hunting in the fall with the spectacular backdrop of the exquisite New England foliage. We look forward to hosting you soon at Leen’s Lodge.